Home » Janie’s Blog » More BAD news if you are on T4-only like Synthroid?? : It might cause Lung Cancer, says a study! More BAD news if you are on T4-only like Synthroid?? : It might cause Lung Cancer, says a study! After worldwide patient experience has revealed that T4-only treatment results in a slew of continuing hypothyroid symptoms, now we have a study which implies that T4-only treatment could be raising your risk of LUNG CANCER. This complete study came out just last Thursday, August 8, 2013, in the Reproductive Biology and Endocrinology journal and it’s certainly not good news, if true, on top of what thyroid patients already know has been a failure in so many ways. The Italian authors said the correlation between lung cancer and T4-only treatment was “significant“! In other words, says the study, as hypothyroid patients raise their T4-only levothyroxine medication to chase continuing symptoms of hypothyroidism, it can lead to medication-induced hyperthyroid state, which in turns leads to an overproduction of oxidative stress. The latter oxidative stress is a known cause of cancer and other chronic diseases. But with T4-use, it’s specifically problematic for lung cancer, implies the study. Oxidative stress can be defined as a that which results in “significant decrease in the effectiveness of your iinherent antioxidant defenses, such as glutathione” (Wikipedia). And there are two main consequences: your body doesn’t detoxify itself well, nor does it repair any damage well because of free radicals. The prevalence of breast, colorectal, gastric and lung cancer in 18 Italian Regions during 2010 was correlated with the sales of LT4 in 2009. The cancer prevalence was analyzed in women aged 30�84. This age range corresponds to more than 80% of the consumers of the drug and to about 99% of all malignant cancers. The correlation between sales of LT4 and cancers was determined with the technique of Density Ellipses. The age and smoking contribution for lung cancer was determined with the Sequential test. 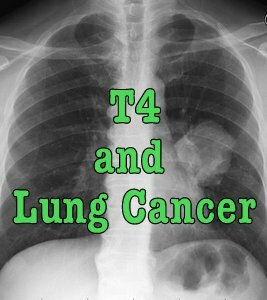 Lung cancer was the only tumor found directly correlated with LT4 supplementation. The authors conclude that “hypothyroidism might also be involved in the development of lung cancer”, but the study does send an alarming message about the correlation between T4 use and lung cancer, as well. One of the main drawbacks of administering T4 in isolation is the possibility that it will not convert adequately to T3, and will therefore ‘back up’ causing excessive T4 activity, i.e. hyperthyroidism. There is also the very real possibility that T4 will not only not properly interact with thyroxine cellular receptors, but will block out what remaining natural levothyroxine the thyroid is still producing (and whose conformational state is far more health-promoting), essentially acting as an endocrine disrupter at the very moment that it is acting as intended as a ‘TSH suppressor.’ This T4 blocking/endocrine-disrupting property of the synthetic form would also activate a negative feedback loop within the endocrine system, further suppressing remaining thyroid function, and resulting in the atrophy of the compromised thyroid, a iatrogenic ‘self-fulfilling prophecy’ if you will. And they conclude: “There is also compelling research indicating that desiccated thyroid extract (Armour thyroid) results in superior clinical outcomes versus the synthetic hormone, especially as concerns improved body weight.” And of course, patients who have switched to natural desiccated thyroid (NDT) have reported FAR better results repeatedly! Brands are not limited to Armour. Other brands which patients like include Erfa, Acella (NP Thyroid), Naturethroid, Westhroid-P and more. Millions of hypothyroid patients have reported millions of prices in their own degree and kind thanks to their use of T4-only medications. Now we have a study that implies your risk of getting lung cancer is increased. What’s next?? It’s not a pretty picture, if the correlation turns out be accurate for some. Time to take a strong and open-minded look at what patients have learned. ADDENDUM FROM JANIE: Please note that this study doesn’t say that every single T4 user is going to get lung cancer. My mother was on Synthroid her entire life, and though she had many miserable symptoms from it being a poor treatment for her, she never got lung cancer. It just seems to say that the researchers noted increased oxidative stress with T4 use, and they saw a correlation between that and lung cancer in some. Read the entire study information here and decide for yourself. My mom started taking a T4 and very quickly developed lung cancer…. The docs who prescribe this crap should go over the fact it is correlated to lung cancer, No if ands or buts. JJ, sorry to read what that stress did to you! Stress also did a number on me two years ago. Use this page to help you find a doctor you might like: http://www.stopthethyroidmadness.com/how-to-find-a-good-doc And remember that no doc, even a better one, is going to be completely caught up with what we have learned repeatedly, so you will have to see if they will be open to your guidance based on what you’re read. http://www.stopthethyroidmadness.com/adrenal-wisdom is a summary, and Chapter 6 in the revised STTM book has all the treatment details patients have shared. The latter chapter also applies to Adrenal Cortex, even though it mentions HC. Scary but good info to know. I was on Levo or Synthroid for many years, then compounded T4/T3 then Levo again and now on Armour Thyroid. I was diagnosed with pleurisy several years ago when I want to emergency room with severe chest pains. So it is very interesting to know this could be related to my thyroid medications. I had no idea. My new current endo loves Levo and prescribed hat to me at my first visit. . He reluctantly put me on 60 mg (30 mg 2/day) Armour Thyroid at my request at my 2nd visit but will not increase it after being on it a month, even though the 150 mg of compounded T4/T3 that I was on before with another doctor who moved, never gave me problems but was still not high enough in my opinion as I still had the hypo symptoms. He actually said more thyroid medicine for me would be like speed, because my test scores are “normal.” He did not care that my symptoms have not improved at 60 mg/day. He said prescribing me a higher dose might put me in the hospital. He is quite proud he is conventional, at his patient’s expense. So the search continues for a doctor who will treat me clinically for my symptoms and not blindly follow test scores. Very frustrating that I cannot find a doctor that is willing to work with me to adjust medications until I feel better. So tired of feeling crappy all the time. Pam, what state do you live in? I found a medical doctor in SC who practices organic medicine. Ok now I have another worry to fuel my health anxiety. I totally freak out on T3 meds. have tried T3 on its own – extremely low dose (got heart palpitations and tachycardia – went away as soon as I stopped the T3), then tried NDT three quarter grain twice daily (was out of my mind- palps were horrendous). Now I am on thyroxine again 50mg much better but still a little anxiety and am suspecting I may have to raise my dose but now I guess I can just sit back and wait to get lung cancer, another worry to aid my anxiety. Jan, this study was simply more about what they felt was “risk”, not about definite outcome. As far as what happens to you on T3, your answer is probably here: http://www.stopthethyroidmadness.com/ndt-doesnt-work-for-me (it also applies to T3) Hope that will give you hope! My VA (Veterans Administration) doctors, including the endochronologists, will not even discuss switching me to NDT even though I used it successfully for one year. It was a wonderful year. Then I moved and my new doctor would not continue with NDT . I considered going online to purchase it, but I was afraid of the unknown. I want my doctor to understand how different my entire life was without synthroid. I am going to explore all the recommendations on this forum to find the right solution for me. By the way, I found out that when I stopped eating gluten, some of the worst symptoms disappeared. I am going to read the article mentioned above about how gluten affects the thyroid. I will take all this information to my doctor along with my old prescription for NDT. Other serious conditions that I have had include Chronic Pancreatitis and Glocoma and Pneumonia (3 times). I’ve been on NDT for 2 years. Suddenly, my holistic Dr. retired so I turned to an endocrinologist. He immediately reduced my NDT and eventually added Levothyroxine. I am 54 and post menopausal(haven’t had a period in 2 years!) and a month after starting the Levothyroxine I got a period! The Endo says that means the Levothyroxine is working and has returned my body to it’s natural state because my periods have returned?! What, at 54 the return of my period is normal??? Really-he said that I never really went through menopause it was just the thyroid imbalance. The pharmacist says it is totally possible for the levothyroxine to induce my period even being menopausal. Ugh! Has anyone had anything like that as a result of T4? One grain of NDT is approx. 38 mcg of T4 and 9 mcg of T3. So it may be that he added enough T4 to more-than-compensate for what he lowered, making it all like a “raise” in total thyroid meds. But do know that the direction he went with you is backwards, say a lot of patients. You might have gotten better results just from raising your NDT–the latter which gives you all five hormones that a healthy thyroid makes. Synthetic Thyroid pills like Synthroid or Levothyroxine are NOT a must. Get diseccated thyroid which is natural, 100% of people who are on that see improvements. A great resource is Dr David Braunstein’s book : Overcoming Thyroid disorders. I’ve been for 5 yeard on synthetic with condition worsening. Now , for the last year I am on natural with every MD trying to get me off them… But I must say that I feel much better and in fact the amount needed is improving. Wow… funny, as soon as I started taking levothyroxine I got pneumonia! 🙁 what is ndt??? I need to do something about this! Lung cancer runs in my family!! Here I am eating healthy organic foods, throwing away my non stick pans… trying to make the right decisions… and I’m pretty much poisoning my self! So does this effect a baby when taking it?? I took it my entire pregnancy!! I have been taking throid replacement for about 20 years. For most of that time I have been on the generic version. I few years ago I started having symtoms of hyper thyroid after getting a new monthly supply. A few times I have taken them back to the pharmacy and told them about my problems and asked if they could be a bad dose and asked them to replace the pills with a different lot. They have and usually it solved my issues. My issues were insomnia, irritability, and heart palputations. For the last few years I have been on synthroid brand because of my sensibility to the generic variations, with none of these side effects. This last month I have had the same side effects with the synthroid. Insomnia was the worst. I got a new monthly supply a week ago and all of the side effects went away and things are back to normal. I can tell that my pharmacist and Doctor think I am crazy when I suggest that the dose is wrong with a particular monthly supply and want a new supply. Has anyone ever heard of this problem? Am I just overly sensitive to slight variations when these pills are manufactured? Back when I was on Synthroid (now I am on Armour Thyroid), I had a bad batch. Within three doses, I was extremely hyperthyroid (could not even close my eyes, was doing pushups in my living room at 2:00 am and could not stop, racing heart). It was really scary. I reported it to the doctor and the FDA. The doctor thought I was nuts and I never heard anything from the FDA. I HAVE BEEN ON LEVOTHROID FOR OVER 12 YEARS. WEIGHT LOSS IS STILL A BIG ISSUE. SO IS DRY SKIN AND FATIGUE. WHAT WOULD YOU RECOMMEND ME TO TAKE? WOULD GLUTOTHIONE HELP? IM CONFUSED AND WILLING TO TRY ANYTHING. Sabrina, here’s what you need: http://www.stopthethyroidmadness.com/natural-thyroid-101 but also get your iron labs done (they can go low from being on an inadequate treatment so long and cortisol checked: http://www.stopthethyroidmadness.com/recommended-labwork). The will need to be treated before you can raise NDT. I use a special glutathione intracellular optimizer (unique in the fact that into gets into the cell …normal glutathione doesn’t survive the digestive system),,I’m on Eutroxsig for thyroid and hashimoto’s ..dosage was all over the place until I went on the natural supplement..now only take 75 micrograms ..and best of all no symptoms.. I was just recently told that I have a 4 mm on my left lobe, I have never smoked. Doctor said come back in a year, I predicated that. I decided to see if their is a connect between Levothyroxine and Lung Cancer, and found these articles online. I have severe Chronic Pain through out entire body. This is frightening. My doc has been slowly increasing my dosage of Synthroid. Last winter, I developed pneumonia and pleurisy. Jamie, I have been noticing a cough here where I can NOT seem to figure out where it is coming from. I have never smoked a day in my life.I am on that gel form of synthroid. The cough drives me up the wall and mom and I have exhausted anything else it could be. That “study” just compared the number of cases of lung cancer in an area of Italy to the amount of levothyroxine sold in that area. It did not address whether the lung cancer patients were taking levothyroxine. That is about as dumb as saying that toothpaste use causes cervical cancer, because in countries where toothpaste is commonly used, there are more diagnoses of cervical cancer. Just to be clear, toothpaste use is higher in developed countries, where they also end of finding more cervical cancer because they are able to find it. By the way, I have been eating carrots for 50 years, and I now have a torn meniscus in my left knee. Those darned carrots! Uh�you are aware that Density Elipses is a legitimate and common analytical tool used in pharmaceutical studies? Which is the method they claimed they used to determine correlation. They didn’t stop there though. Four cancers correlated with the T4 only med use, but the study found only lung cancer was directly associated with the meds. They went on to explain why. The statistical analysis was only the starting point. Like a criminal investigation – four guys were in the area at the time of the incident, so all four are persons of interest but ultimately only one was found to be directly involved. The starting point for data in the case is the assessment of correlating factors. But we don´t know if NDT also causes lung cancer, do we? Or if combination therapy does. Until we get more info, I think all we can do is intelligently speculate. The article was more about potential oxidative stress (and hypothyroidism) causing the connection between lung cancer and T4 use. So it’s what we might be doing to cause oxidative stress, which I’m not sure NDT does, and which T4 use could definitely do, since it leaves so many patients with continued hypothyroidism. Or, I can see it could be about the way one doses exogenously. See the next STTM blog post about oxidation. I’ve been taking Levothorxine since my total thyroidectomy in 2007. Took a couple of years to find the right dose, but since then I really feel great. So while your article is certainly food for thought, I’m not inclined to fix something that’s not broken. I have been taking levothyroxine for over 30 years and I have lung cancer! I hope that each reader who’s on levothyroxine prints the linked research document and shows it to his or her endocrinologist! Doctors need to know about this research as further justification for trying NDT in those hypothyroid patients who don’t do well on levothyroxine. Janie, thank you for sharing this with your readers! I recently had my right lung removed due to lung cancer, and never was a smoker who has taken Synthroid for about 20 years. I am convinced there is a co-relation between my thyroid/auto immune issues and the cancer. Unfortunately, I do not transition well to ANY T3 products so far. It sets off my auto-immune reaction. But, I am working with a physician to get where i need to be so I can try an NDT product again. AMEN to being aware of everything we can to help ourselves. Gail, to be armed with knowledge, empowers you to be your own health advocate. Dr.’s do not know everything. It’s just that simple. They are people just like we are. If you don’t feel at this point in time you have a choice about taking T4, then at least armed with this knowledge, you have the ability to increase your own self care. To Detox on a daily basis, look into Green Smoothies. We can’t simply rely on modern medicine for our health. We must be aware and do everything we can to help ourselves!!! Anytime new truths are brought out into the open, that has to be welcomed, even if it is kind of scary at the time. We need to be aware of these things and make sure our doctors are aware also. Why are you frightening people who have no choice but to take the T4 they are given????????? There is ALWAYS a choice..Look into how gluten effects thyroid function! And people should be scared…Ignorance is certainly NOT bliss when it comes to stuff like this!! It’s stupid to just ignore!! I agree very much with Gail. My doctor won’t even change my generic to name-brand and I DON’T have a choice. I don’t have health insurance and am only lucky enough to get treated through a payment program at one of our hospitals here. But I can’t go anywhere else, because they don’t offer programs like this one hospital does. You can inform people in an unbiased manner in a less frightening way. People SHOULDN’T be scared unless they have a reason to be. Meaning, there are LOTS of people who have been treated successfully with generic or T-4 only medication, but you likely won’t hear about them online because they are out there living their lives. The people who are online are here because they are searching for answers. So you could possibly be fine with your T-4 only treatment, but this article and the way it’s written would have you scared out of your wits that you’re harming yourself, for no good reason except that it didn’t work for a few others. It makes no sense. Take everything online with a grain of salt. Everyone is different and not everyone “should” be scared. Your excitement comes off as fanatical nonsense. I was diagnosed with both thyroid and lung cancer. oh the thrill for me. but I have been struggling for 3.5 years to find the answer to why out of no where would I loose 80 lbs, no diet change, no change other then a few months before my daughter was married. I’ve have a gland in my neck my whole life that I can remember kinda big…. about the time I lost the weight it became very big and developed a pulse, I was told I’m nuts not in so many words…… now Im going to turn this around on the very health care facilities that said this. because I was basically ignored, I am not going to start my fight with a 12mm cancerous lump (node) and 6 or more nodes3-6mm in my lungs, yep both lungs lucky me I get the draw the short life span straw. So if you too want to feel scared because you were smart enough to stumble across this page before it was too late. Count your lucky stars…. because the outcome is not that good for me. Totally disagree with you. Warning people of nasty negative effects of toxic medications is a beautiful blessing. My mother is having serious complications from this garbage, and I’d prefer she lives many more years and without the vicious side effects of this crap. There are natural alternatives which do not disrupt your system like this. How on earth is data on the dangers of a product “scaring people”? Is warning people who want to swim there are sharks in the reef “scaring people”? Go ahead, swim then. I’m personally very thankful for this article. Gail and Angela-There is always a choice. The one of the post below says…print this out and take it to the dr that is T4 only frenzy. Or find a new dr. Or order Thyroid-Gold. There is always a way. I don’t have insurance either and found a way. I searched and it was tough but found a dr that takes cash and gives a discount for low income. He’s amazing. And prescribes NDT and doesn’t let you suffer on T4 only. There is always a way. Just got to fight for it. My mother who is 92 and myself have been on a natural thyroid medication called Amour Thyroid. It is made from a pigs stomach. My mom has been taking it for 15 years and I have been on it for 5. We have very good results in our tests. The doctors of course keep telling us that its not available when we are up for renewal but I always say yes it is. Please just write the script and send it to my pharmacy. A couple years back when the US couldn’t order it I did have to order it from Canada but was a simple task. But no issues getting it ever since. Do some research– the less synthetic stuff we put in our bodies the better. Armour thyroird IS NOT MADE FROM PIGS STOMACH. THEY USE THE PIGS THYROID ONLY. we all cant afford Arnour Thyroid!!!!!!! There is an alternative to Synthroid. Armour is on the market and Wellness Resources has a product called thyroid helper when used in combination with iodine ( which is very deficient in people ) is amazing . There are a few problems with this. One, it contains guggul which could mimic the effect of estrogen–the last thing some women need. Second, not everyone has low iodine, even if some do. Third, even if one’s iodine levels are low, iodine has frequently not been enough to treat hypothyroidism for many, even if for a very small minority, it has been enough. And finally, it is only a nutritional supplement, and a lot of patients need thyroid hormones to feel better, not just the supplements of ashwagandha, guggul, manganese and tyrosine. Granted, these facts don’t take away that some feel better on it! But for others, it can have problems, nor is it all they need. Most do well on natural desiccated thyroid.